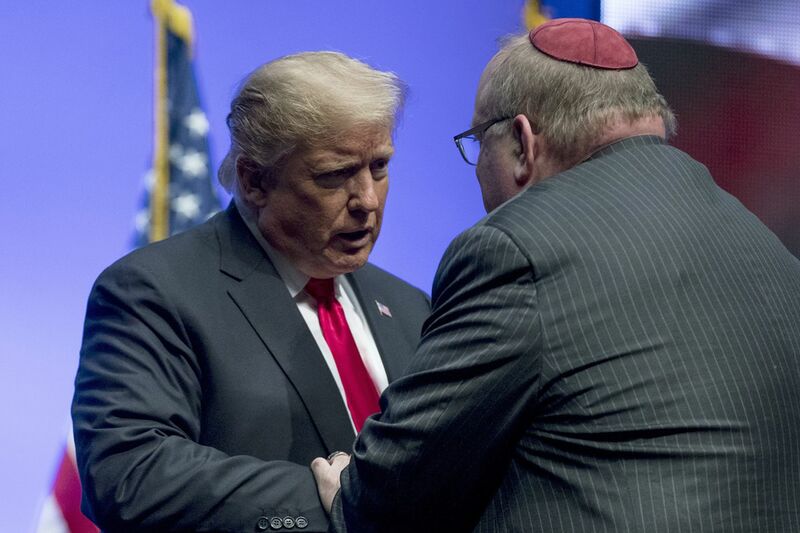 President Donald Trump embraces Rabbi Benjamin Sendrow after he prays at the Future Farmers of America Convention and Expo in Indianapolis on Saturday. Following a mass shooting that claimed the lives of 11 congregants at the Tree of Life synagogue in Pittsburgh, President Trump will travel to Pennsylvania on Tuesday, according to White House press secretary Sarah Huckabee Sanders. "They're grieving. They're hurting. The president wants to be there to show the support of this administration for the Jewish community," Sanders said at a news briefing Monday. She said first lady Melania Trump would also travel to Pennsylvania. The White House didn't immediately disclose further information about the visit. Pittsburgh Mayor Bill Peduto told reporters on Monday that the city doesn't have enough safety personnel to cover the funerals for victims and a presidential visit at the same time. He also urged the White House to speak with grieving families before finalizing any plans. "I would ask that the White House staff contact the families and ask them if they want the president to be here," Peduto said, according to the Pittsburgh Tribune-Review. "If the president is looking to come to Pittsburgh, I would ask that he not do so while we are burying the dead." During an appearance Sunday on Meet the Press, Peduto said Tree of Life was a Conservative synagogue, where families typically hold funerals quickly. Brothers David and Cecil Rosenthal, two of the congregants killed in Saturday's shooting, will be buried Tuesday. Two leaders at Tree of Life, appearing in separate interviews on CNN on Monday, were split on whether they would welcome Trump as families mourn. "I do not welcome this president to my city," said Lynnette Lederman, the synagogue's former president. "He is the purveyor of hate speech. The hypocritical words that come from him tell me nothing." Lederman said the city benefits from strong local leadership by individuals who believe in "not just Jewish values but believe in values. And those are not the values of this president. And I do not welcome him to Pittsburgh." Moments later, Rabbi Jeffrey Myers, who was leading the service when the gunman opened fire on Saturday, told CNN he believed the president of the country should always be welcome. "I don't really foist blame upon any person. Hate does not know religion, race, creed, political party — it's not a political issue in any shape or form," Myers said. "I'm a citizen. He's my president. He is certainly welcome." While presidents have postponed political events in the wake of national tragedies (President Barack Obama canceled a rally and traveled to Colorado following the deadly mass shooting in an Aurora movie theater in 2012), Trump kept a scheduled appearance Saturday at a rally in Southern Illinois, just hours after what is believed to be the deadliest attack on the Jewish community in the history of the United States. "This evil, anti-Semitic attack is an assault on all of us. It's an assault on humanity. It will require all of us working together to extract the hateful poison of anti-Semitism from the world," Trump said at the rally. "The scourge of anti-Semitism cannot be ignored, cannot be tolerated, and cannot be allowed to continue." More than 35,000 people have signed an open letter written by 11 Jewish leaders of the Pittsburgh affiliate of Bend the Arc, a progressive organization focused on social justice, demanding Trump fully denounce white nationalism and stop targeting immigrants and minorities before he could be welcomed in their city. "For the past three years, your words and your policies have emboldened a growing white nationalist movement," the Jewish leaders wrote. "You yourself called the murderer evil, but yesterday's violence is the direct culmination of your influence." Trump was widely criticized when he initially failed to condemn white nationalism and the Ku Klux Klan after a deadly white supremacist rally in Charlottesville, Va., last year where attendees chanted, "Jews will not replace us." Instead, Trump told reporters there was "blame on both sides," noting there were "bad people in that group, but you also had people that were very fine people, on both sides." Press secretary Sanders told reporters: "The president has denounced racism, hatred, and bigotry in all forms on a number of occasions, We'll continue to do that. I'm doing it here today."